Chic, remarkable, unique and undeniably useful; the Rocco Outdoor Wicker Side Table (Java) is a great addition to many collections! 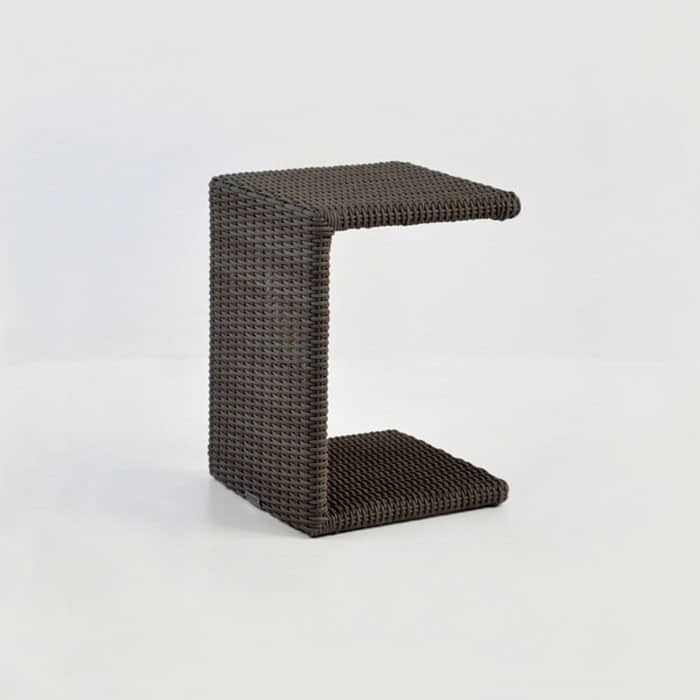 The Rocco Outdoor Wicker Side Table (Java) is C-shaped, to slot in under many pieces of furniture – specifically complementing any of the wicker sun loungers we sell, easily sliding over the side of the lounger to provide a sturdy place to set your drink down within arm’s reach, as well as being a fabulous standalone piece next to a relaxing chair or part of a larger collection. W16" x L16" x H20"
The terrific Rocco Outdoor Wicker Side Table (Java) is built on a powder coated aluminium frame, sturdy, hard wearing and long lasting. Powder coating won’t rust or corrode outdoors, and it is a wonderful material to wrap our all weather wicker on! 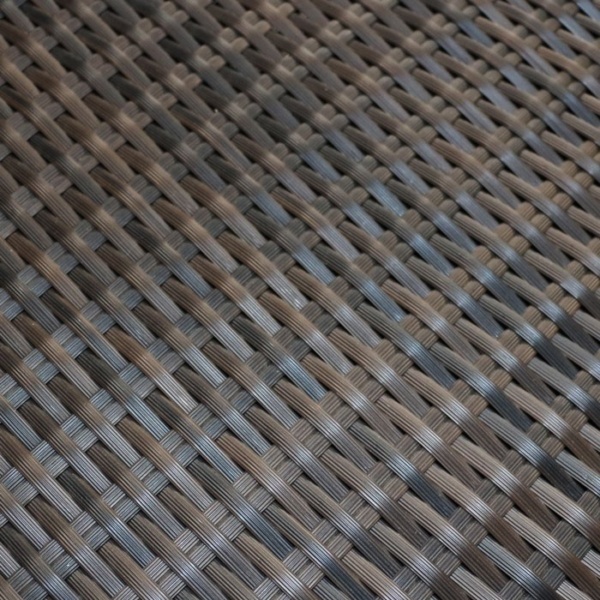 The Viro® wicker is one of our fabulous brands of polyethylene synthetic fabrics for outdoor use. Viro® has become an increasingly popular choice, because along with being UV treated, through dyed and resistant to changing temperatures, the companies business practice is eco-friendly. So you can rest easy in your luxury, outstanding, splendid furniture knowing the impact on the environment is a friendly one! Teak Warehouse now carries three brands of all weather wicker, Viro® Rehau® and Ecolene® – all made to stay outside year round! We like to give our customers options – so you can choose what texture and color will work for you! Being in business for over 20 years means that we can offer excellent, luxury furniture at a fraction of retail prices. It brings us great joy to offer furniture that is not only stylish but is long lasting. The proof is in our product and our customer feedback! Explore the joys of sun loungers, bar units, divine deep seating, resplendent relaxing chairs, diverse and delightful dining tables, pots and planters and much more to choose from. We don’t just have wicker – look into A-Grade Teak for beautiful, solid pieces that span the range of our furniture styles. Reclaimed Teak speaks to a more rustic look, perfect in country homes or in an upmarket contemporary environment. Our other amazing products include #316 Stainless Steel, Textilene® mesh, Batyline® mesh, Aluminium, Resin, and chunky Raw Concrete. Perking up your poolside? Try a line up the Rocco Outdoor Wicker Side Table (Java) and a series of our incredible matching wicker loungers in the same Java color. 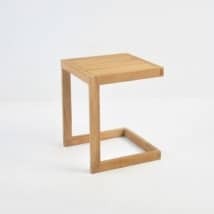 The table will happily tuck in underneath, forming a beautiful combination that is sleek and gorgeous to look at. The Rocco Outdoor Wicker Side Table (Java) can also be placed alongside different materials for a great blend of textures you will love. Try it with a Stainless Steel and Mesh Relaxing Chair or Lounger for a very contemporary, chichi look. Teak Warehouse is open 7 days a week. 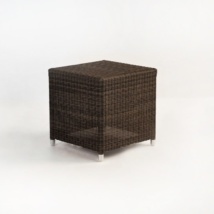 Call us now to order your Rocco Outdoor Wicker Side Table in Java. 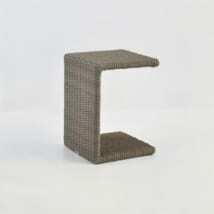 Our Rocco Outdoor Wicker Side Table (Java) is also available in Kubu Gray so you may customize to suit your space. We know this cute, versatile piece will serve you well for years to come.